SpaceX is gunning to create history with the test flight of the Falcon Heavy on February 6. The private space giant has been given the green light for Falcon Heavy’s first-ever launch and we cannot be any more excited. In addition to the primary mission of launching and delivering Falcon Heavy’s payload to its intended orbit, SpaceX is attempting the secondary mission of landing all three of Falcon Heavy’s first stage cores, during this mission. If you know anything about SpaceX, the company is focused on making rockets reusable multiple times before they can eventually be discarded and put into a shed to rust. It has struck numerous first-stage landings, such that it now looks like a routine at this point. But, the odds have changed with this launch. SpaceX has propelled and landed only single first-stage boosters until date, but the Falcon Heavy packs three of those. This means the company will have to chart the recovery paths in a manner that all three boosters make it safely back to Earth, without colliding in mid-air. SpaceX’s recovery plan is quite ambitious, but Musk had himself expressed reservations about the landing of all three boosters during the test launch. It might also be looking forward to full reusability by attempting the recovery of the upper stage, but the chances of the same happening are quite low. As for how and when you can catch the Falcon Heavy launch, you’ll be able to witness the lift-off and landings via a live stream on SpaceX’s website tomorrow at 10:30 AM PT (12:00 AM IST Wednesday/ 6:30 PM GMT). 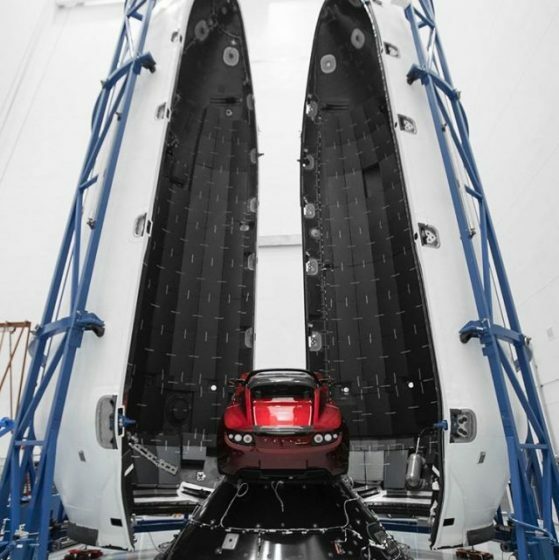 The lift-off is going happen from the iconic Apollo launch complex 39A at Cape Kennedy, and the payload is an original red-colored Tesla Roadster. If the weather conditions stay favorable, the launch is going to happen at this exact time, else the space giant has a 2.5-hour window to make it happen. So, will you be streaming the Falcon Heavy’s first launch? And, how positive are you that SpaceX will recover all the three boosters? Tell us your opinions in the comments down below.